We all know that feeling of dread when a common cold starts to show its symptoms. Runny nose, sneezing, sore throat, coughing, and headaches can make the simplest everyday tasks seem impossible. Luckily for some, regular exercise does strengthen the immune system, making active people slightly less susceptible to the common cold. Unfortunately, that doesn’t mean your workouts are the ticket to a clean bill of health year round. 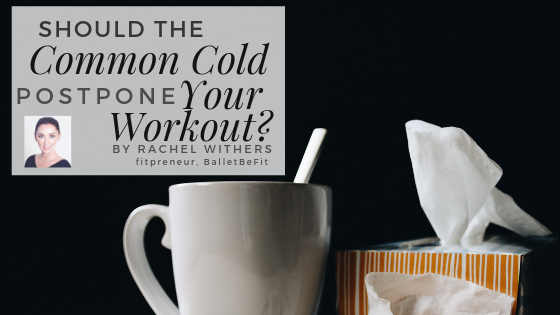 When you get hit with a cold, it may throw off your typical workout routine, but that’s okay. Here’s what you should know about exercise and your illness. Exercising with a common cold isn’t impossible. When symptoms are “above the head,” such as a runny nose, sneezing, minor sore throat and a stuffy nose, it’s usually safe to work out. If you’re well hydrated, your workout may even help to clear some congestion. Remember that your body is using some of your energy to fight the cold, so your workout should not be long and intense. For example, you can walk instead of run. What’s important is listening to your body. For someone who is on a regular routine, it can be difficult to willingly skip workouts when illness strikes. However, anyone with widespread muscle aches, fever or extreme fatigue should think twice about committing to strenuous activity. A few days off won’t destroy your progress. If anything, it could give your muscles some much needed time to heal. You may risk dehydration or other serious complications if you push your body too hard when you’re sick. You should especially avoid attending exercise groups when you are under the weather. When exercising with other people, you could unwittingly spread your illness to them. According to the National Health Service, the common cold is contagious a few days before symptoms appear, and can remain contagious until all symptoms subside. People are most likely to spread the virus within the first 2-3 days — when symptoms are at their worst — but the window when germs can spread is around 2 weeks. Once you begin to feel better, it could be time to resume your normal workout routine. However, you should do so gradually. If your cold symptoms don’t subside in a timely fashion, or if you feel sick or lightheaded during your workouts, it may be best to consult your medical professional. A common cold doesn’t have to derail your entire life, but you should make an effort to let your body heal and minimize contact with other people.